RBTH presents a selection of views from leading Russian media on international events, featuring the meeting between John Kerry and Sergei Lavrov in Paris and unrest in Kiev. Russian daily Kommersant provided details on the meeting between U.S. Secretary of State John Kerry and Russian Foreign Minister Sergei Lavrov that took place yesterday in Paris. According to a newspaper source, in addition to the implementation of the Minsk Agreement on the conflict in Ukraine, Kerry wanted to discuss the situation in Iraq and Syria, where Americans have been carrying out air strikes on ISIS. A representative of the Russian delegation told Kommersant that the Obama administration is looking for some foreign policy successes on the eve of the Nov. 4 midterm elections, which is what motivated the talks in Paris. According to Kommersant, the Russian delegation expected the Americans to ask Moscow to put pressure on the pro-autonomy forces in southeastern Ukraine – in particular, the U.S. would like the several border checkpoints to be transferred to the Ukrainian authorities. In turn, Lavrov was expected to ask Kerry when the U.S. would start lifting the sanctions against Russia, since the situation in the Donbass is much less tense than before the signing of the Minsk Agreements. 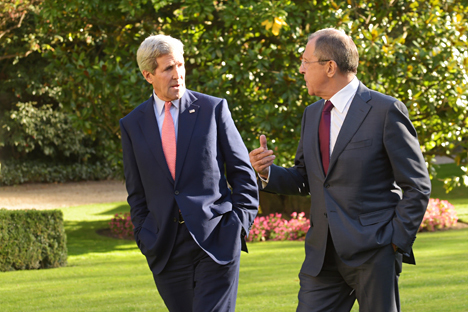 However, before the Paris meeting, Lavrov announced that he would not ask Kerry about the prospects for lifting the sanctions. Press Digest: Will Turkey use war against ISIS to change regime in Syria? In another article on the same subject, Kommersant adds that some progress regarding the situation in Ukraine was made during the talks. Despite differences in their positions on Ukraine, Lavrov and Kerry both expressed their support for the implementation of the Minsk Agreements on the truce in the Donbass. According to Kommersant, Kerry admitted that Russia had pulled its troops back from the Ukrainian border, although he added that "the U.S., the Ukrainian government and the entire international community" do not recognize the results of the referendums on self-determination in eastern Ukraine and the only legitimate vote will be the parliamentary elections scheduled for Oct. 26. The Kiev correspondent for newspaper Nezavisimaya Gazeta reported on unrest in the Ukrainian capital. On Monday, members of Ukraine's National Guard staged a protest in front of the presidential administration building. On Tuesday morning, members from various radical organizations took over and burned tires on the square next to the Ukrainian parliament, the Verkhovna Rada. Several demonstrations took place at the same time beside the Verkhovna Rada. Judging by the posters on display, some were asking the government to provide help to those who had fled eastern Ukraine for the capital. Others encouraged the government to continue fighting in the Donbass, while still others were protesting in support of the lustration process and the removal of corrupt officials from power. The biggest demonstration, which was organized by the Svoboda political party, arrived at the Verkhovna Rada demanding the recognition of the Ukrainian resistance fighters known as the Ukrainian Insurgent Army as World War II veterans who had fought for the freedom and independence of Ukraine. Members of the resistance have been denied this status because they are considered to have sided with the Nazis against the Soviet forces. During the morning session of the Verkhovna Rada, Chairman Oleksandr Turchynov made seven unsuccessful attempts to place the bill recognizing the veterans on the day's agenda. Tuesday in Kiev ended with riots and arrests. The Ukrainian government blamed the Russian secret services for the unrest.